RIVERSIDE, Calif. -- Riverside Fire Department to the rescue! 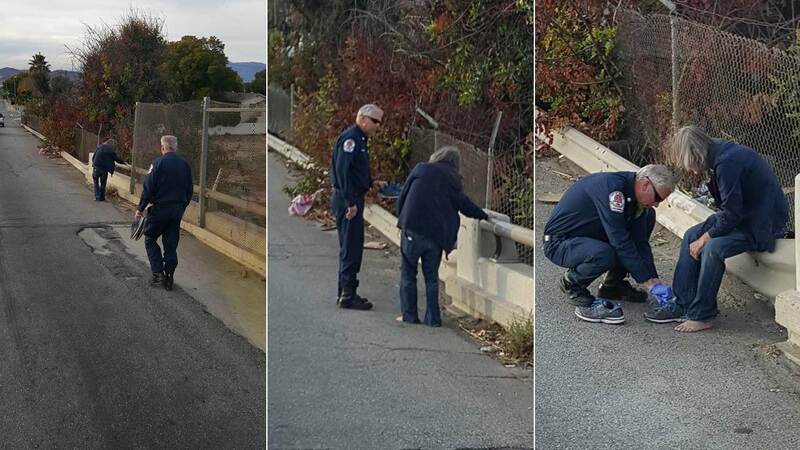 The crew of Engine 6 went out of their way to help a homeless man found walking on the freeway without shoes. Firefighter David Gilstrap and Capt. Rob Gabler were returning from training when they noticed a man limping slowly across a freeway overpass barefoot. The crew pulled over. Gilstrap gave the man his tennis shoes and Gabler helped put the shoes on the man and also offered him some water. The Riverside Fire Department shared the sweet story on its Facebook page, where the post garnered hundreds of likes.